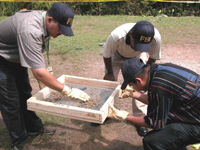 Stoney Knoll sifting screens are built to the exacting standards required for field work in archaeology, paleontology, forensic science and law enforcement. They have been tested through years of service to provide optimal performance under the toughest conditions. Each sifting screen is hand-built in our family owned, coastal Maine, shop. The screens are comprised of select, clear, New England White Pine - which is lighter than Southern/Yellow Pine or Ponderosa Pine and resistant to splitting and twisting - making our screens durable, yet surprisingly light and easy to carry. The White Pine we use is SFI certified - meaning that the wood which comprises our screens is sustainably forested. 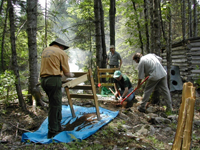 (For more information about the SFI program, visit www.sfiprogram.org.) We do not, and will not, use wood species whose harvesting may be attributed to environmental degradation. All wood is planed and sanded to eliminate rough edges prior to assembly. Rocking sifter handles are shaped for comfort during use. Standard screen sizes ensure expedient delivery. Custom orders are welcome. 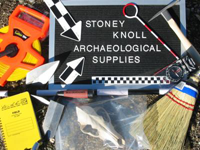 Stoney Knoll also offers a full range of archaeological supplies. We are currently running two to three weeks in screen production and the cutting wire mesh replacements. If you need your sifters sooner or have a deadline, we will do everything we can to expedite your order. Please let us know!